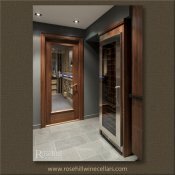 (SL) Our custom wine cellars are finished with exterior grade doors. This maple wine cellar door has a dark finish and includes a full glass inlay with a black metal handle. The door presents a perfect view to this personal wine collection. (SL) This Redwood finished door includes a full glass inlay, rustic black metal handle and door hinges. 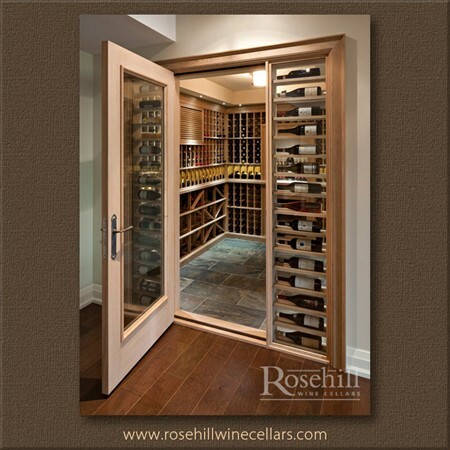 This glass entrance door allows viewing of the custom wood wine racks within. 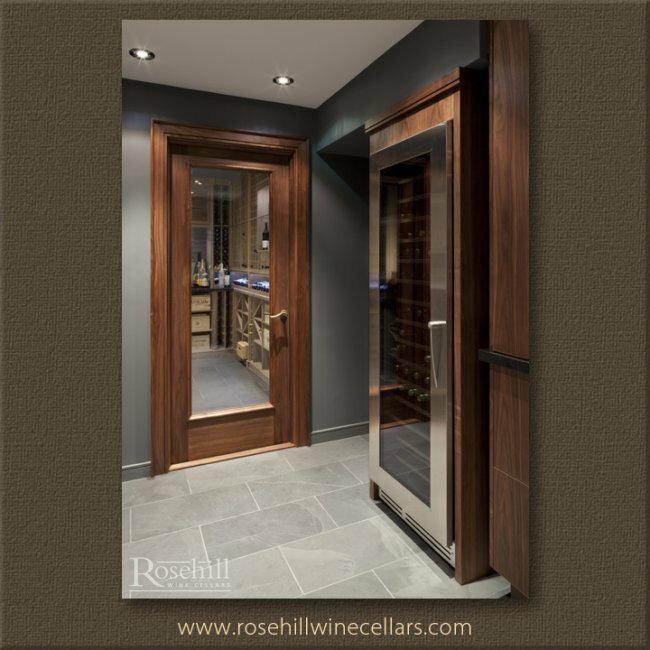 Our custom wine cellars are finished with exterior grade doors to keep the cold in and the heat out. (SL) This two tone custom door with black outer frame presents an interesting juxtaposition to the two toned billiards table. 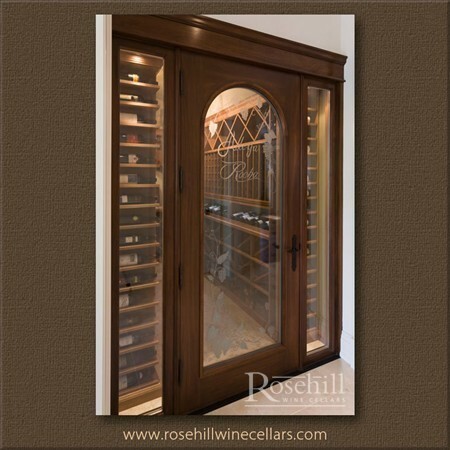 The walnut door has a dark finish, to complement the wine racks within this custom residential wine caller. The exterior grade door complements the décor of the adjacent billiards and entertaining room. 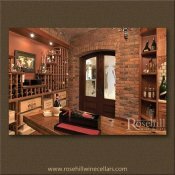 (SL) This rustic custom wine cellar, has an old world look throughout its interior. The door treatment complements the look of the space and creates an inviting entry . 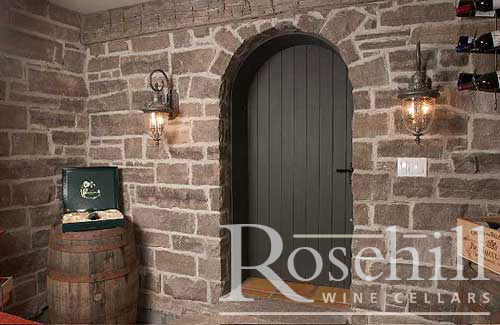 The old look door still has full exterior grade insulation for maintaining the ideal climate conditions within the cellar. The rustic exterior grade door is designed to keep exterior warm temperatures out of the cellar and the cold air in. (SL) To create the old world feel within this custom wine cellar brickwork is carried throughout the interior entrance. The tasting niche is flanked by right and left waterfall uppers with lower section holding wood case bins. 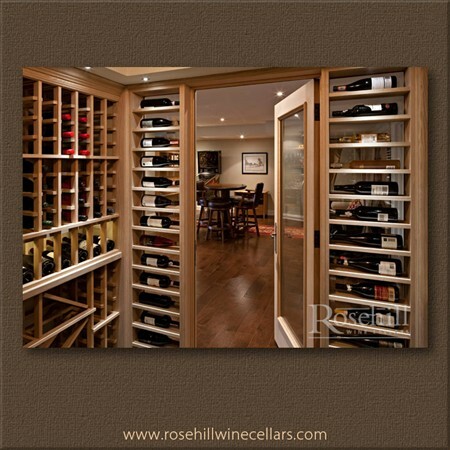 The variety of storage provides both bulk storage, individual bottle storage and display area for wine accessories. 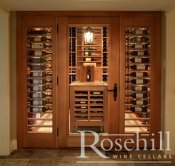 The wine cellar is on full display to adjacent family room with exterior grade double doors. 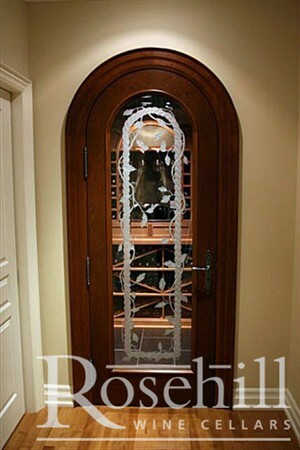 Additional door details include sandblasted glass with etched female figure. 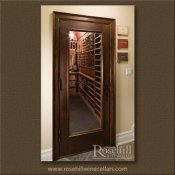 (SL) Exterior Grade door in Walnut with bees was finish allows for grand entry to custom wine cellar. This dark door finish includes a full glass inlay with a black metal handle and hinges. 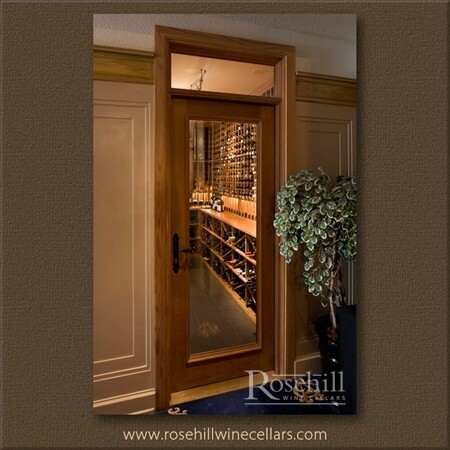 The door helps to keep the inside cold, while keeping the heat out and allows for view of the entire wine room. 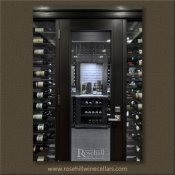 Viewing full presentation display wine racking within the cellar is made easy with a full glass door. (SL) Sapele finished custom door provides a nice contrast and view to the wine cellar within. 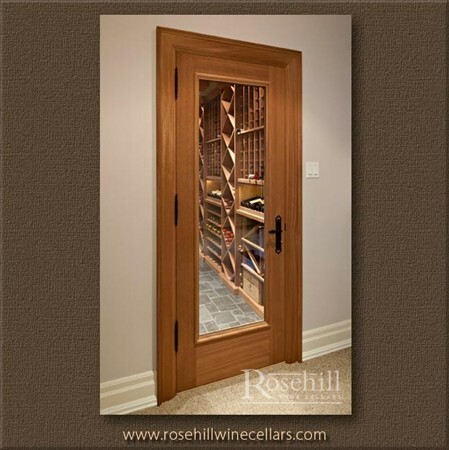 The custom door features a full glass inlay and rustic bronze metal handle. Sapele is used for the both the door and door trim to provide clean consistency for the adjacent room. 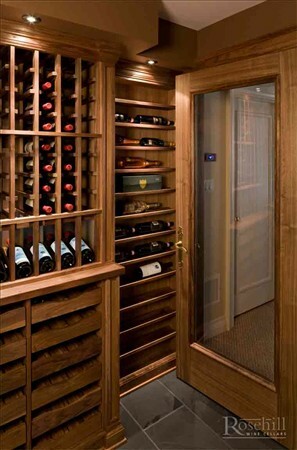 The trim also complements the adjacent cabinetry housing a built in Cavavin wine cabinet with stainless steel door. (SL) The Walnut finished, exterior grade door, provides a full glass inlay and light metal finish handle. 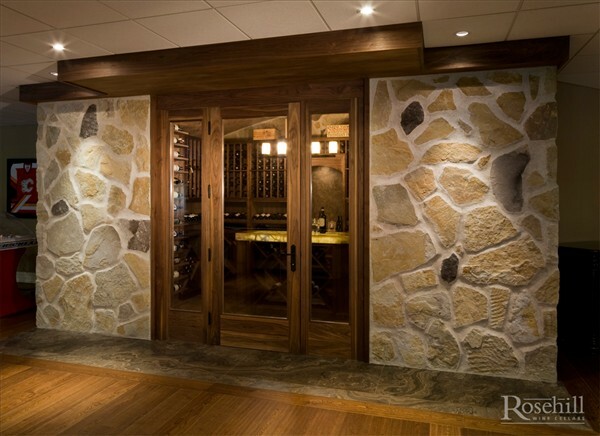 The walnut door and wood frame complement with walnut wine racks within this custom cellar. 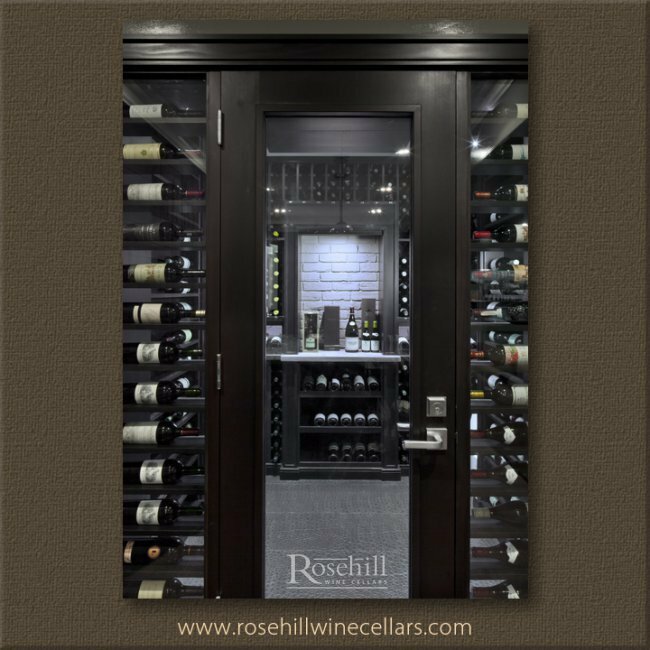 This cellar is made up of individual single bottle storage racking, plus a two styles of presentation racks and sliding walnut drawers. (SL) The dark stained door features a glass inlay with rod iron trim, metal handle and hinges. 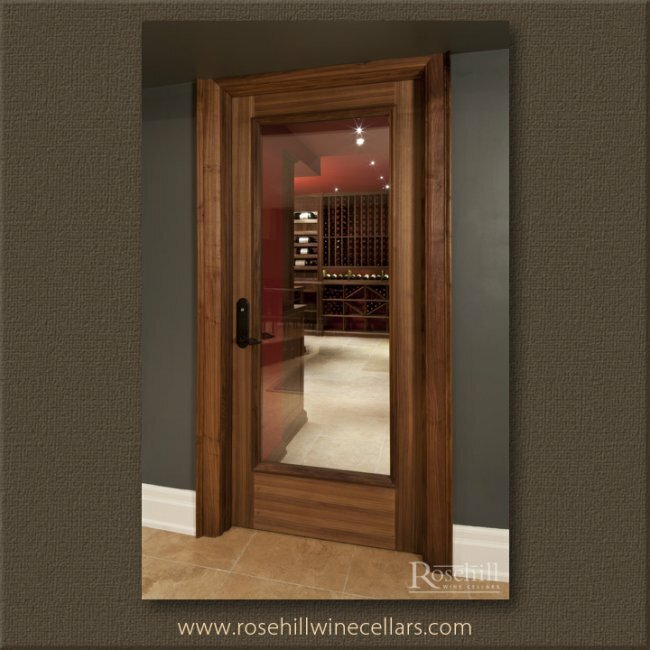 Wood door with matching door jambs complement the wooden finishing details within the cellar. Inside the custom wine cellar both individual bottle wine racks and diamond bin racking is used. 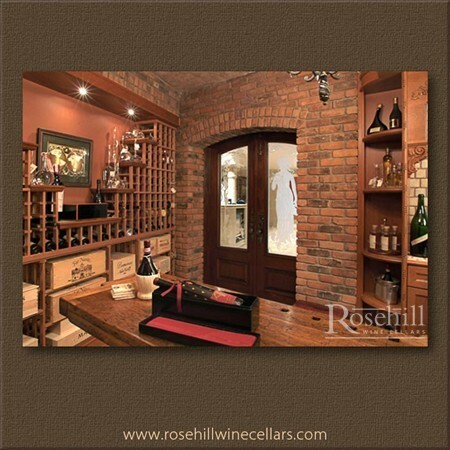 (SL) The exterior of this wine cellar has a brick façade giving an old world feel at entry to the wine collection. 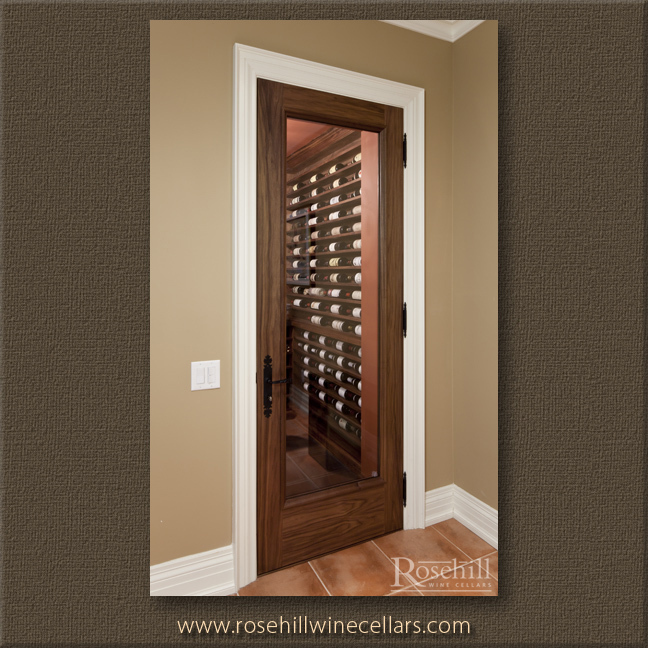 Main double door and arched sidelites allow a glimpse to the wine collection within. Each of the outer arched panels are accented with glass inlay, rod iron trim, and distressed wood. 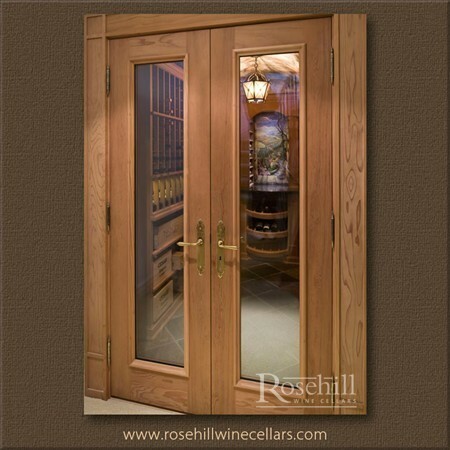 The main French doors leading into the cellar also feature glass inlay, with an over the door glass inlay pocket. Notice the wrought iron chandelier within the cellar to continue the medieval feel of the cellar. 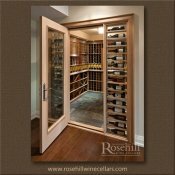 (SL) The detail in this custom wooden cellar door provides oversized crown details in addition to the outer door framing. The custom cellar door is exterior grade, with a glass inlay and black door handle. Direct viewing behind the door a tasting table is centered with stone detail within. 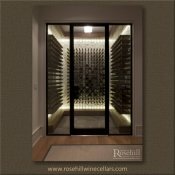 (SL) The inset custom wine cellar door finished in wrought iron surrounding crest with black metal handle. 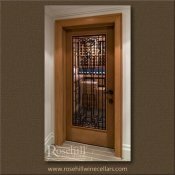 The door features rod iron detail within the glass inlay, and a etched crest design in the upper area of the door. Inside the custom wine cellar a Sapele arched tasting niche is featured with a lighted stone backing. 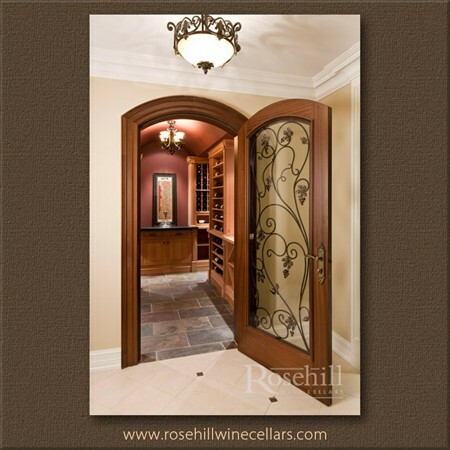 (SL) The exterior grade custom wine cellar door provides simple details within the arched door and frame. 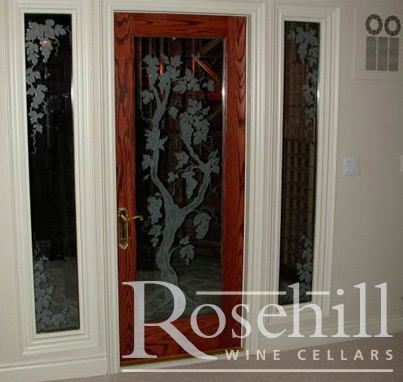 Additional details are provided with an etched grapevine design in the glass inlay. (SL) This beautiful Walnut finished door features a full glass inlay with a rustic black metal handle and hinges. Wood jambs stained the same as the door itself. The glass doorallows a clear view to the entire wine room. Inside, the custom walnut racking incorporates a variety of storage options. Racking includes case bins, diamond bin storage, presentation display racking, and individual single bottle storage. (SL) The formality of the adjacent space to the wine cellar is accented with pale yellow walls and white trim. 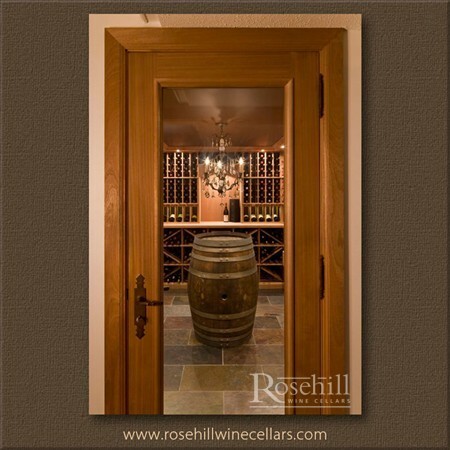 The whimsical wine cellar door pops, against the lighter tones of the wall and trim surrounding it. 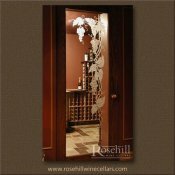 The glass inlay features a wine theme including etched grape vines, wine glass, bottle and even a few corks. This door provides a playful entrance to the more formal adjacent room. 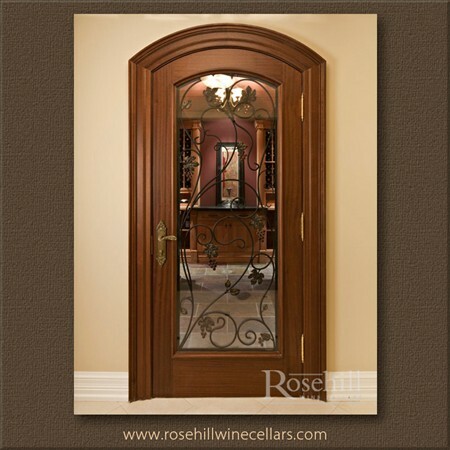 (SL) The beautiful arched Sapele door and frame incorporates a grapevine wrought iron design behind the glass inlay. The entrance to this custom wine cellar provides an enticing glimpse to the custom wine cellar. 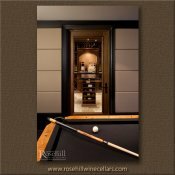 The wine cellar itself features custom wood columns anchoring both sides of the tasting niche directly behind the door, a more formal approach for a serious wine collector. 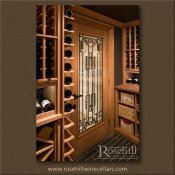 (SL) This photo with open wine cellar door highlights the attention to detail with wrought iron featured in both the door and the light fixture. 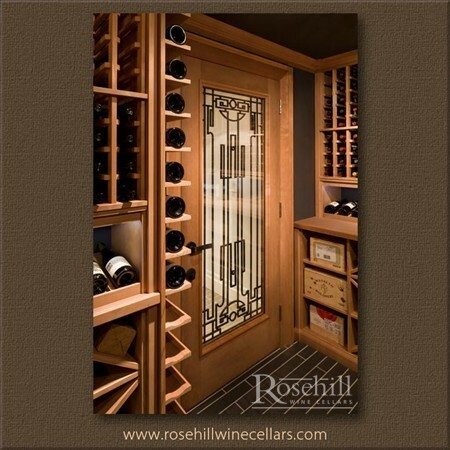 The exterior grade door along with the rod iron detail, provides a perfect entrance to the wine cellar collection. 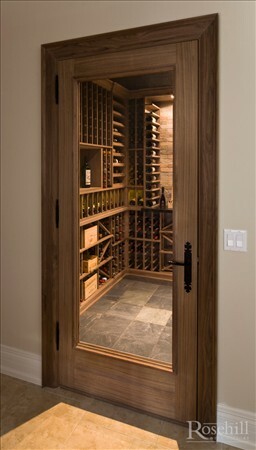 (SL) Framing the entrance to this custom wine cellar is an oversized door flanked by two side lites. The display panels showcase the wine collection within by having label forward racking adjacent to the glass. Welcome to the cellar where the light slate flooring leads you to custom wood racking and wine cellar cooling unit hidden behind a wood grill to the left of the image. 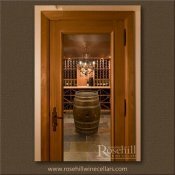 (SL) This view through the entrance of this custom wine cellar shows the seamless flow from cellar itself to the living space on the other side. 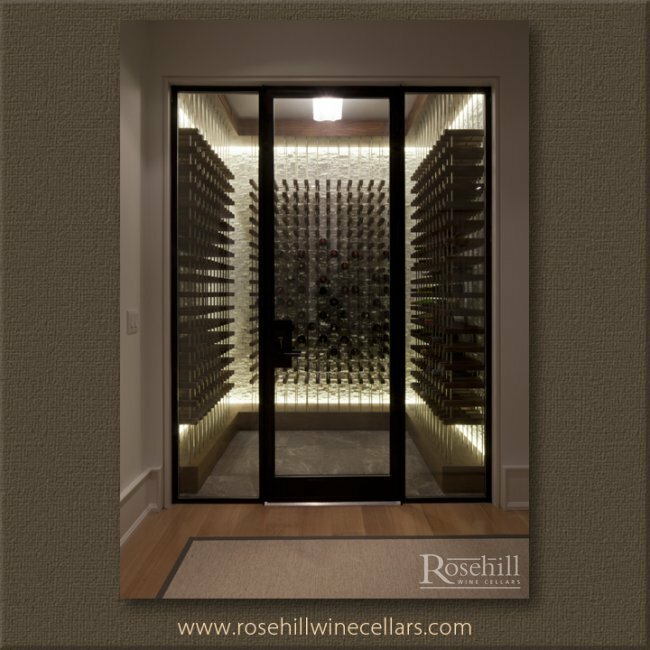 The horizontal, label forward display racking frames the doorway; this design detail maximizes cellar exposure to showcase the wine collection. (SL) It all starts with the look and materials used to finish the exterior of the custom wine cellar. 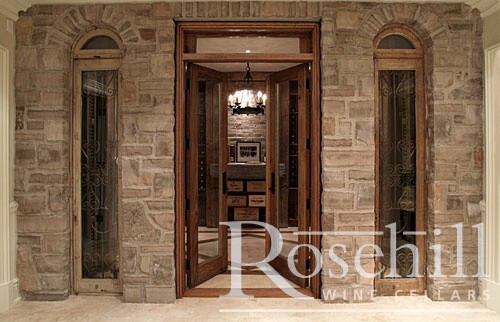 The light colored stonework with dark accents complements both the marble flooring that frames the entrance of the cellar and the wine cellar door itself. The walnut exterior grade door finished with bees wax provides an unobstructed view through the clear glass inlay and side lites. (SL) A Redwood custom door is finished with a black rustic metal handle. 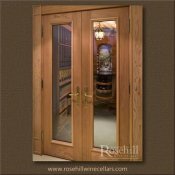 The door is also furnished with a clear glass inlay and an above door glass pocket. This adds addition height to the door frame creating a grand entrance to this residential wine cellar. Inside the cellar, is an unobstructed view of the extra deep counter rail with double deep wine racks below. 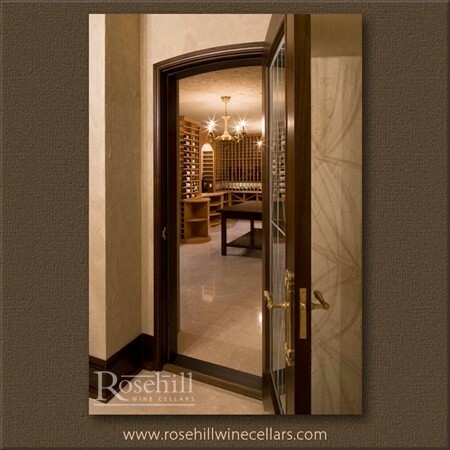 (SL) Brass hinges and rustic metal handle accent the exterior grade custom wine cellar door. 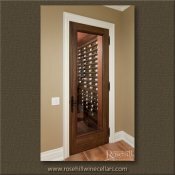 The redwood door includes a clear glass inlay which presents a unobstructed view into the wine cellar and centered recycled wine barrel. (SL) French door entry to this wine cellar are both exterior grade with weather stripping on all four sides. This keeps the warm air out while keeping the cool air inside the cellar. 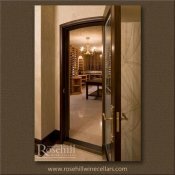 The double glass doors are accented with rustic brass metal handles and hinges. (SL) This custom door is finished with a dark water based stain and top-coat to further bring out the richness in the wood. 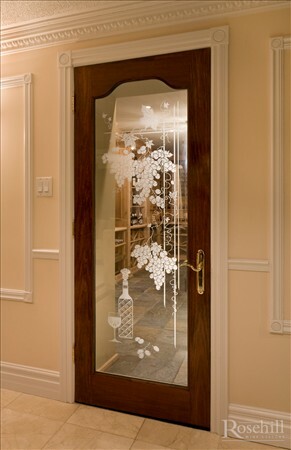 The clear glass door with grape vine motif is an exterior grade door. 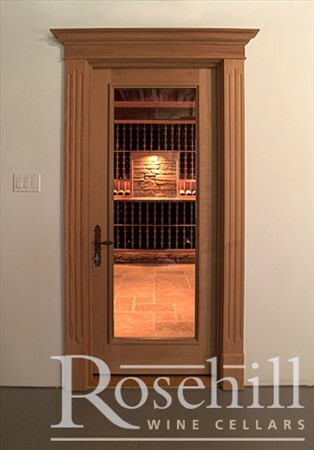 (SL) A clear glass pane provides an open view to this custom wine cellar through this hearty yet minimalist door. The door is treated with a dark water based stain finish and top coat and also features rustic black french hardware with mortise lock and skeleton key. (SL) Expanding the doorway design each side presents a horizontal label forward display rack to create a grand entrance to this custom cellar. The exterior grade door with arched top is finished with dark stain, etched thermal pane glass and black rustic hardware. Four hinges are required to hang this heavy wooden door. The door treatment is further embellished with an oversized upper crown molding. (SL) The exterior grade wine cellar door in redwood features arched glass top to mimic arched ceiling within. 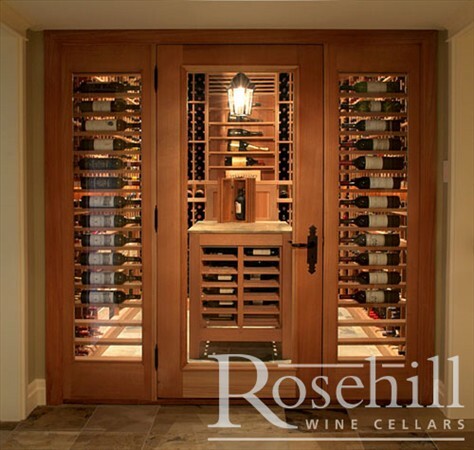 The open door provides an inviting entrance to traditional wooden wine cellar. Note that the interior of the door is unstained to match the wine racks within, versus the previous image shows dark stain on door and surrounding trim. At the end of this narrow cellar an arched tasting niche further complements the ceiling design. (SL) The entrance to the custom wine cellar has a dark water based stain and top-coat. 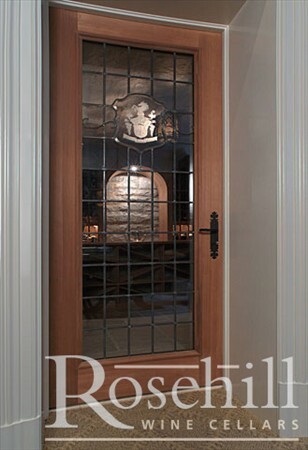 Etched thermal pane glass with lead panel dividers are incorporated into the door design. 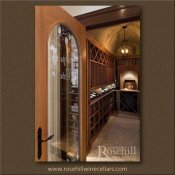 (SL) An metal insert to a custom door provides additional details for this entrance to customized residential wine cellar. Incorporated within the thermal pane glass, sits a brushed wrought iron metal design in art deco look. The door handle hardware is rustic black, to further accent the metal design within the door. 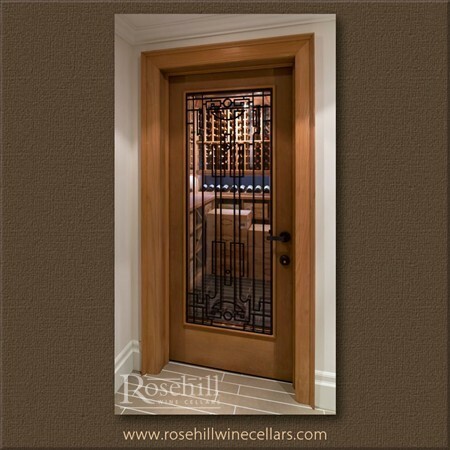 (SL) Art Deco looking wrought iron insert in thermal pane door is beautiful example of a wine cellar door. The door handle hardware is rustic black, to further accent the metal design within the door. Exterior grade door with weather stripping on all sides is designed to keep the cool air in. 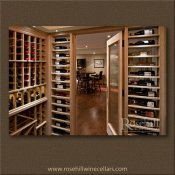 Prime example of residential wine cellar featuring custom wood wine racks and mill work. (SL) A modern contemporary feel is achieved with the choice of a dark water based stain for wine cellar door and wooden wine racks. Exterior grade door features a clear thermal pane of glass, with brushed nickel hardware. 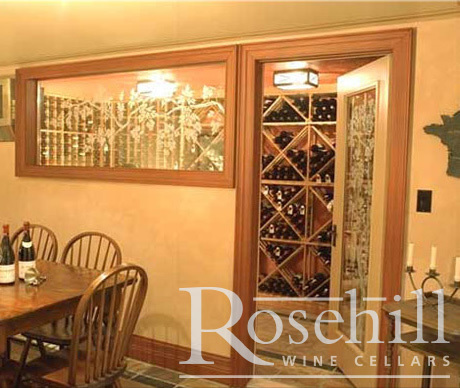 (SL) Entrance to this custom wine cellar is a clear thermal pane glass door accented with rustic black metal hardware. Door jambs and door are stained to a medium tone. The clear door shows off the design detail of wood racking within. 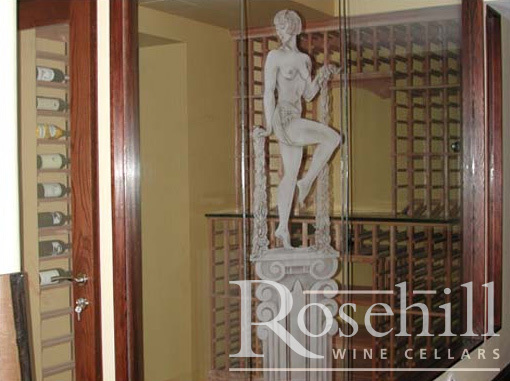 (SL) The custom built wine cellar door and adjacent viewing window incorporates a floor to ceiling thermal pane of glass with a scantily clad woman standing on a pedestal. Medium dark water based stain and top coat on door jambs and trim. Premier Cru wine racking within wine cellar. 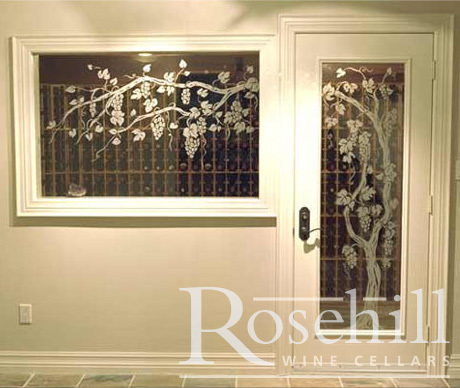 (SL) This wine cellar door and adjacent viewing window features exterior white finish on trim and walls with etched grapevine design on the glass. 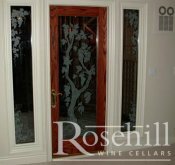 The door has a thermal pane of glass with a grapevine design and lever door handle with lock. 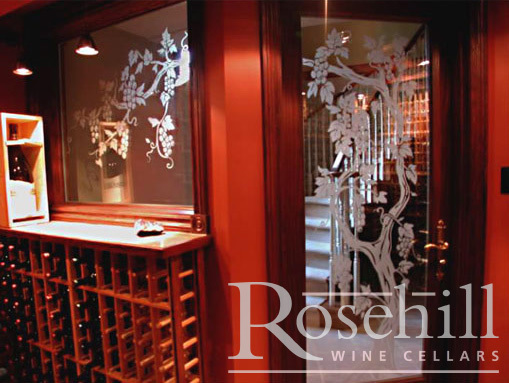 (SL) Etched thermal pane exterior grade glass door with sandblasted grapevine design provides enticing entrance this custom wine cellar. 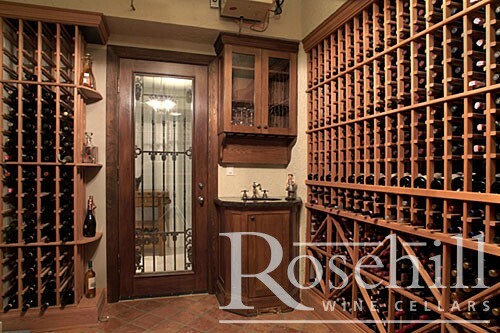 Rustic French hardware with mortise lock and skeleton key allow for secure entry to the wine collection within. This is the first formal cellar we built after building one for David Lawrason – This cellar still looks great after all these years.